How do you describe your work, Terry? I would describe my jewelry as bold and colorful. 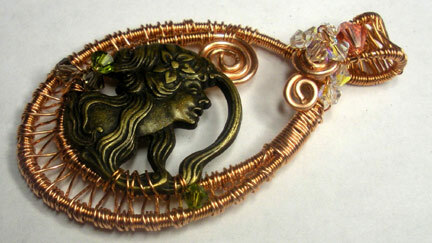 A lot of my work are like little wearable sculptures, wire mosaics, wearable art. I am known as Wired4Style by my friends on the internet. 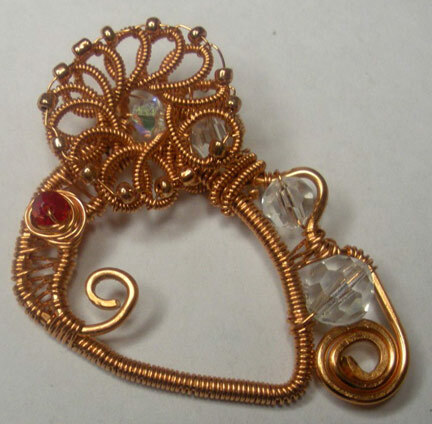 I wanted wire somehow in the name since I love working with wire, metals and stones. I am in the process of change and am on a journey to connect with a much more personal name that reflects me as an artist and a person. My jewelry falls into the art jewelry/ sculpture category. I am an eclectic designer with a love to recycle whenever I can. Taking bits n pieces from broken or discarded treasures is exciting to me. I love taking something ordinary and turning it into something extraordinary. When it comes to color, I’m not shy. The bolder the better. I love sitting at my desk by the window. My honey made me a custom L shaped desk that faces our bedroom window. It is there that I do my intricate work. I love listening to music while I create. I usually plug into my mp3 player, that way I can tune out the world. I am easily distracted and tend to take frequent breaks because of my arthritis. Most of the time, I have several projects going at once. I have no formal jewelry education. 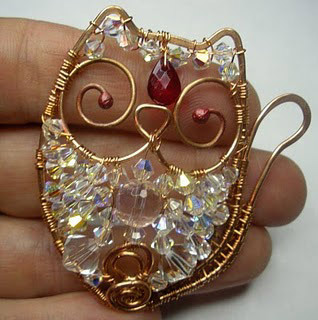 I am a self-taught jeweler. 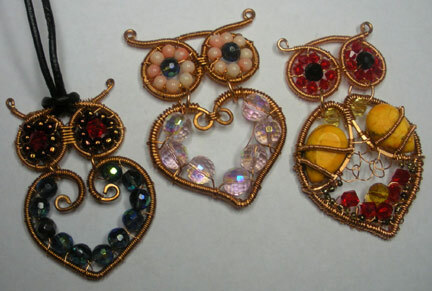 I have learned all my wire wrapping skills from books, magazines, and online tutorials from some very talented artists. I have taken art and photography classes which have helped me tremendously. I still remember that pivotal moment when my jewelry interests dove into wire. 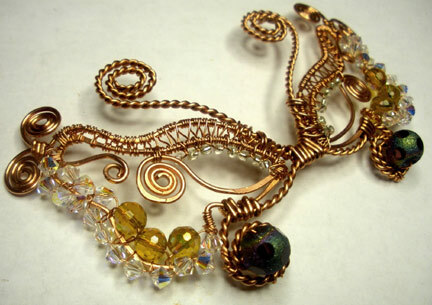 I stumbled upon jeweler Eni Oken’s website and from that moment on, I fell in love with wire, stones and colorful beads. I was always making jewelry for family and friends. I realized it could be more than a hobby for me when I got requests for custom jewelry and developed a returning clientele. I sure love my wire. When I’m not working on a piece, I will still fiddle around with wire! I recently invested in a torch. Thank the fire gods. How I managed without one is beyond me. A lot of my inspirations come during dream time. If a design appeals to me, I try and imagine it in wire. Nature is also very inspiring and helps me to create. Most any shape can be formed with wire. Creating is very therapeutic for me and helps me manage living with Rheumatoid Arthritis. Sometimes, jewelry work can be quite challenging and trying but the end result is always rewarding. Having talented artists in the house is very uplifting. My daughter is a talented musician and my life partner is an artist, as well. Have a sense of humor. I can’t tell you how many times I felt like pulling out my hair over a piece gone wrong. It’s ok to make mistakes, that’s how you learn. Challenge your skills. There is so much information out there to help you grow as an artisan. I cherish all my magazines, books and online tutorials. Most important, have fun! When I’m not creating, I love spending time with my family and my doggies. My granddaughters have also taken an interest in art and making jewelry. I would say my favorite comfort food is pasta. I love all kinds of pasta. In the mornings I love my cup of French vanilla coffee. Wow! Very Inspiring! I never thought wire items could be so delicate and detailed. 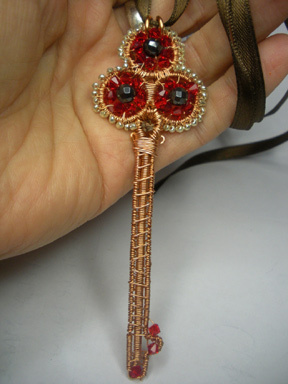 Many thanks to you for sharing my profile and work here at Beading Arts.